Yesterday’s BSI Coordinator Event was awesome! A mighty group of educators met to hear about important developments across the state and to talk student success. 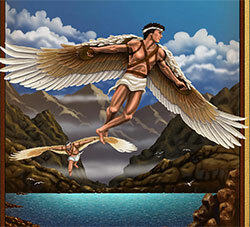 Wondering why Daedalus and Icarus? John Hetts, Senior Director of Data Science at Educational Results Partnership, gave an inspired presentation titled “Let Icarus Fly: The Four Cornerstones of Gateway Course Completion and Success for All our Students.” Like Icarus, who couldn’t fly too high or low, we need to find a happy medium where students are placed in courses that challenge them and facilitate learning. In addition, Alketa Wojcik, Basic Skills Advisory Committee Chair, RP Group Board member and Dean of Student Services at Mira Costa College explained the changes to BSI reporting and facilitated integrated planning for BSI, SSSP, and Equity. More discussion across campus constituents can happen on our campuses to leverage funds and enhance the great work we’re doing. Danielle Duran, Senior Program Director with the Cal-PASS Plus team at Education Results Partnership, explained the Common Assessment Initiative. California is embarking on an unprecedented task to create a multiple measures system, and it’s clear that educators across the state need to weigh in to help develop it.